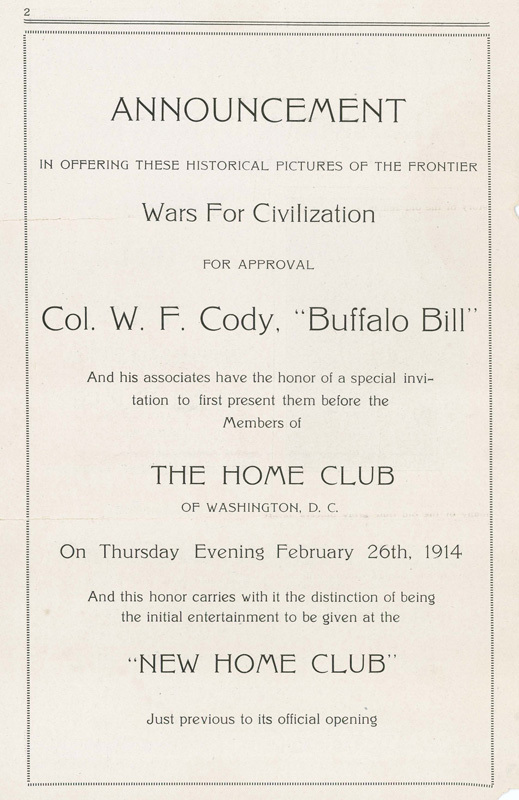 ESSANAY FILM MANUFACTURING COMPANY, of CHICAGO, ILL.
Col. W. F. Cody, "Buffalo Bill"
THE HOME CLUB OF WASHINGTON, D. C.
From the War Path to the Peace Pipe—Echoes from the Pine Ridge Hills in a National Narative With the Old Guard in the Saddle. As Told by Colonel William F. Cody, Himself. My object and desire has been to preserve history by the aid of the camera with as many of the living participants in the closing Indian wars of North America as could be procured. It is something that has never been done before; that is, to preserve our old wars for future generations by living or moving pictures. I first broached this subject to Secretary of War Lindley M. Garrison and Secretary of the Interior Franklin K. Lane, and they approved of taking these remarkable pictures, provided they could be made historically correct, and would tell the story of the old Indian wars and the progress of the Indian from the days of savagery up to the present time. 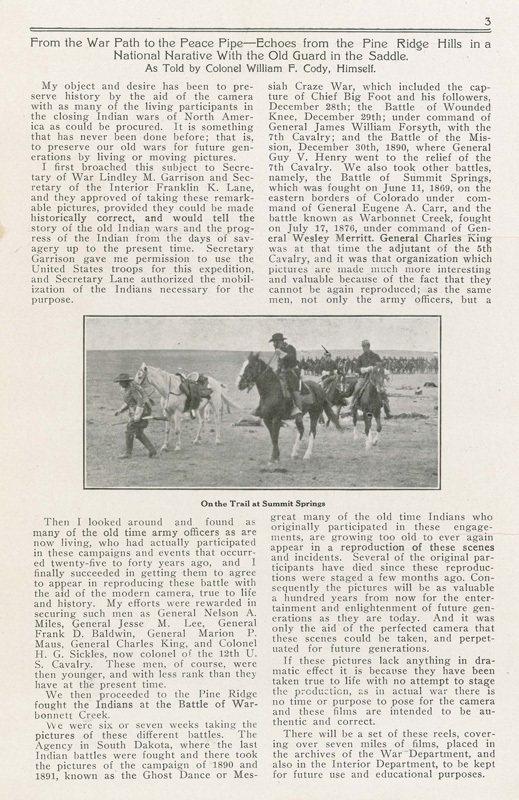 Secretary Garrison gave me permission to use the United States troops for this expedition, and Secretary Lane authorized the mobilization of the Indians necessary for the purpose. Then I looked around and found as many of the old time army officers as are now living, who had actually participated in these campaigns and events that occurred twenty-five to forty years ago, and I finally succeeded in getting them to agree to appear in reproducing these battle with the aid of the modern camera, true to life and history. My efforts were rewarded in securing such men as General Nelson A. Miles, General Jesse M. Lee, General Frank D. Baldwin, General Marion P. Maus, General Charles King, and Colonel H. G. Sickles, now colonel of the 12th U.S. Cavalry. These men, of course, were then younger, and with less rank than they have at the present time. We then proceeded to the Pine Ridge fought the Indians at the Battle of Warbonnett Creek. We were six or seven weeks taking the pictures of these different battles. The Agency in South Dakota, where the last Indian battles were fought and there took the pictures of the campaign of 1890 and 1891, known as the Ghost Dance or Messiah Craze War, which included the capture of Chief Big Foot and his followers, December 28th; the Battle of Wounded Knee, December 29th; under command of General James William Forsyth, with the 7th Cavalry; and the Battle of the Mission, December 30th, 1890, where General Guy V. Henry went to the relief of the 7th Cavalry. We also took other battles, namely, the Battle of Summit Springs, which was fought on June 11, 1869, on the eastern borders of Colorado under command of General Eugene A. Carr, and the battle known as Warbonnet Creek, fought on July 17, 1876, under command of General Wesley Merritt. General Charles King was at that time the adjutant of the 5th Cavalry, and it was that organization which pictures are made much more interesting and valuable because of the fact that they cannot be again reproduced; as the same men, not only the army officers, but a great many of the old time Indians who originally participated in these engagements, are growing too old to ever again appear in a reproduction of these scenes and incidents. Several of the original participants have died since these reproductions were staged a few months ago. Consequently the pictures will be as valuable a hundred years from now for the entertainment and enlightenment of future generations as they are today. And it was only the aid of the perfected camera that these scenes could be taken, and perpetuated for future generations. If these pictures lack anything in dramatic effect it is because they have been taken true to life with no attempt to stage the production, as in actual war there is no time or purpose to pose for the camera and these films are intended to be authentic and correct. There will be a set of these reels, covering over seven miles of films, placed in the archives of the War Department, and also in the Interior Department, to be kept for future use and educational purposes. THE STORY AS ILLUSTRATED BY THE MOVING PICTURES. The evolution of photography, which, from the advent of Daguere to these Edisonian days, has through the marvelous movies worked wonders, now adds another form of value to its usefulness, in its aid in registering historic subjects. The Col. W. F. Cody (Buffalo Bill) His- [photograph] Col. Cody Consulting With General Miles torical Picture Company's replica of war path scenes and frontier time fac-similies presents the trailing, scouting maneuvers leading up to three thrilling battle events in three stirring campaigns in Indian warfare, from 1869 to '91; and the closing chapter in a drama covering 300 years—the final—forever—Indian Peace Congress—with the leading principals in the saddle now, as then. This has been accomplished by the recognition of the worth of such work gaining the assistance of the Hon. Lindley M. Garrison, Secretary of War, Major-General Leonard Wood, Chief of Staff, U.S.A., and Secretary of Interior Franklin K. Lane, and other government officials who discovered in it a facile manner of instructing the masses in the history of the closing era, after the Civil War. It is fitting that such stirring times in national history should be made familiar to the younger inheritors and the million of adopted citizens who enjoy the benefits now, living on the very raiding ranges and battle grounds that fate decided, perhaps harshly, the "survival of the fittest." 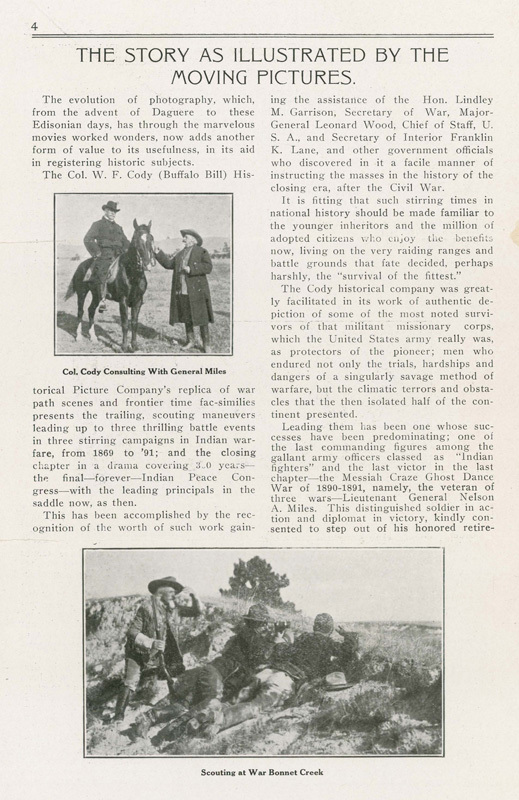 The Cody historical company was greatly facilitated in its work of authentic depiction of some of the most noted survivors of that militant missionary corps, which the United States army really was, as protectors of the pioneer; men who endured not only the trials, hardships and dangers of a singularly savage method of warfare, but the climatic terrors and obstacles that the then isolated half of the continent presented. Leading them has been one whose successes have been predominating; one of the last commanding figures among the gallant army officers classed as "Indian fighters" and the last victor in the last chapter—the Messiah Craze Ghost Dance War of 1890-1891, namely, the veteran of three wars—Lieutenant General Nelson A. Miles. This distinguished soldier in action and diplomat in victory, kindly consented to step out of his honored retire- [photograph] Scouting at War Bonnet Creek [photograph] Capture of the Emigrant Train ment to figure as he did twenty-two years ago in that, to him, most treasured memory, the final surrender, the last peace pact to live in future Indian Legends as the Pacificator. Major-General Jesse M. Lee, Brigadier General Charles King, Brigadier General Frank Baldwin, Brigadier General Marion Maus, all old coadjutors from the'60's whose stars were all won by the merit route. 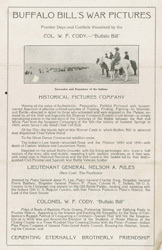 Colonel Sickles, now in active command of the Twelfth U.S. Cavalry, who was an officers in the celebrated Seventh U.S. Cavalry, was in the original Messiah Ghost Dance campaign, and the incidental battles of Wounded Knee and the Mission, was fortunately in command of Fort Robinson, the nearest post, and was a wondrous factor with his battalions of regulars in aiding the cause of faithful portrayal. 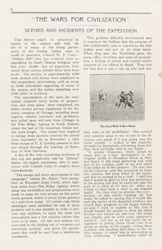 "Short Bull," still a moving spirit, in a more moderate religious sense, among his people, led in person hundreds of warriors, many veterans of the warpath of the powerful Red Cloud, Ogallalla and Spotted Tail Brule Sioux through the familiar scenes that will now be preserved, which would otherwise be distorted tribe lore, when even the picturesque garb of the La Ketas will be only seen in State and National museums. 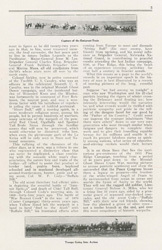 This rallying of the clansmen of the other days, as it were, was a tribute to one who represented a distinctive class that can never be duplicated, a class combining with the nomadic white man's characteristics, the nature lore and traits of the Indian—all rallied to assist that product of border land, prairie born, boyhood schooled and in manhood developed all-around-frontiersmen, hunter, guide and army scout, Col. W. F. Cody—"Buffalo Bill." The old scout therefore had efficint aides in depicting the eventful battle of "Summit Springs" and death of Chief Tall Bull, through Colonel Cody's unerring aim, in 1869—forty-four years ago. 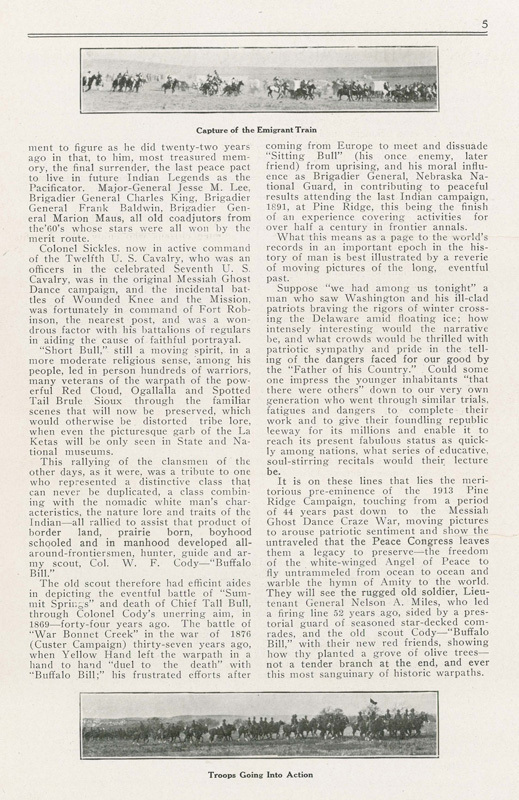 The battle of "War Bonnet Creek" in the war of 1876 (Custer Campaign) thirty-seven years ago, when Yellow Hand left the warpath in a hand to hand "duel to the death" with "Buffalo Bill;" his frustrated efforts after coming from Europe to meet and dissuade "Sitting Bull" (his once enemy, later friend) from uprising, and his moral influence as Brigadier General, Nebraska National Guard, in contributing to peaceful results attending the last Indian campaign, 1891, at Pine Ridge, this being the finish of an experience covering activities for over half a century in frontier annals. What this means as a page to the world's records in an important epoch in the history of man is best illustrated by a reverie of moving pictures of the long, eventful past. Suppose "we had among us tonight" a man who saw Washington and his ill-clad patriots braving the rigors of winter crossing the Delaware amid floating ice; how intensely interesting would the narrative be, and what crowds would be thrilled with patriotic sympathy and pride in the telling of the dangers faced for our good by the "Father of his Country." Could some one impress the younger inhabitants "that there were others" down to our very own generation who went through similar trials, fatigues and dangers to complete their work and to give their foundling republic leeway for its millions and enable it to reach its present fabulous status as quickly among nations, what series of educative, soul-stirring recitals would their lecture be. It is on these lines that lies the meritorious pre-eminence of the 1913 Pine Ridge Campaign, touching from a period of 44 years past down to the Messiah Ghost Dance Craze War, moving pictures to arouse patriotic sentiment and show the untraveled that the Peace Congress leaves them a legacy to preserve—the freedom of the white-winged Angel of Peace to fly untrammeled from ocean to ocean and warble the hymn of Amity to the world. They will see the rugged old soldier, Lieutenant General Nelson A. Miles, who led a firing line 52 years ago, sided by a prestorial guard of seasoned star-decked comrades, and the old scout Cody—"Buffalo Bill," with their new red friends, showing how thy planted a grove of olive trees—not a tender branch at the end, and ever this most sanguinary of historic warpaths. SCENES AND INCIDENTS OF THE EXPEDITION. 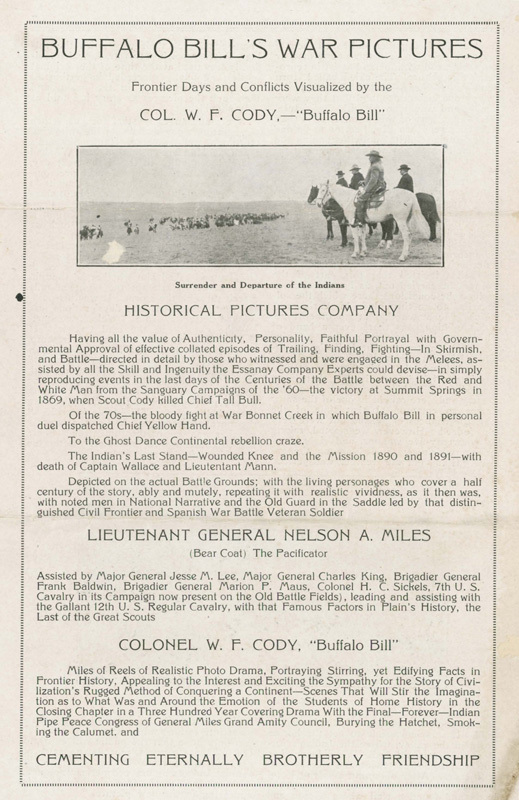 That history might be preserved by means of the camera and with the aid of as many of the living participants in the closing Indian wars as could be procured, Colonel W. F. Cody—"Buffalo Bill"—has just returned from an expedition to South Dakota bringing with him over 30,000 feet of negatives, from which these motion picture films have been made. The service of approximately 3,000 men, women and horses were employed in this stupendous undertaking, with as many as 2,000 individuals appearing in some of the scenes, and the action extending over 2,000 miles of territory. The reproduction of the wars for civilization required many weeks of preparation, and when plans were completed, the entire motion picture equipment of the Essanay company of Chicago, including many experts, camera operators and producers, was called upon and sent from Chicago to the Pine Ridge Agency in South Dakota, where the last of the important Indian battles were fought. The actual time required in taking these pictures covered the period from September 26, to November 1, 1913. 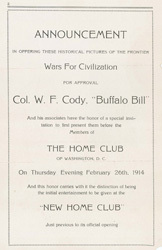 Four troops of U.S. Cavalry assisted in this war drama through the courtesy of Secretary of War Garrison. A few of the very interesting incidents of this trip are graphically told by "Johnny" Baker, the expert marksman, who is associated with Colonel Cody in staging these reproductions. 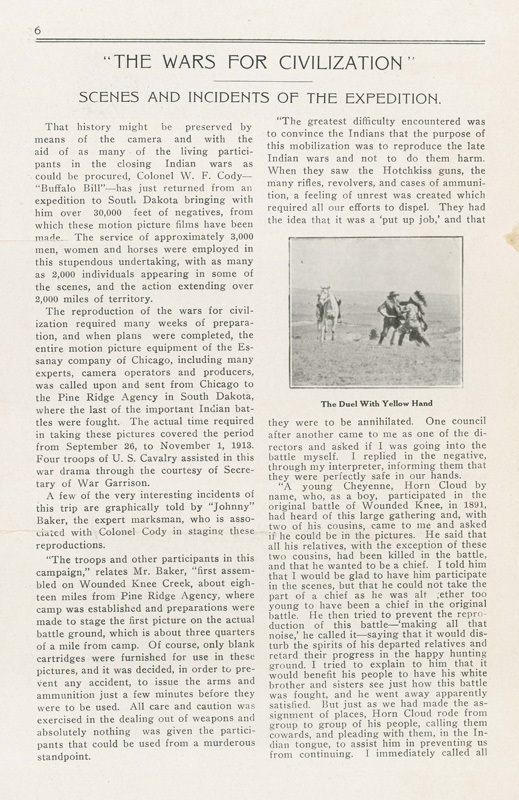 "The troops and other participants in this campaign," relates Mr. Baker, "first assembled on Wounded Knee Creek, about eighteen miles from Pine Ridge Agency, where camp was established and preparations were made to stage the first picture on the actual battle ground, which is about three quarters of a mile from camp. Of course, only blank cartridges were furnished for use in these pictures, and it was decided, in order to prevent any accident, to issue the arms and ammunition just a few minutes before they were to be used. All care and caution was exercised in the dealing out of weapons and absolutely nothing was given the participants that could be used from a murderous standpoint. "The greatest difficulty encountered was to convince the Indians that the purpose of this mobilizaton was to reproduce the late Indian wars and not to do them harm. When they saw the Hotchkiss guns, the many rifles, revolvers, and cases of ammunition, a feeling of unrest was created which required all our efforts to dispel. They had the idea that it was a 'put up job,' and that [photograph] The Duel With Yellow Hand they were to be annihilated. One council after another came to me as one of the directors and asked if I was going into the battle myself. I replied in the negative, through my interpreter, informing them that they were perfectly safe in our hands. "A young Cheyenne, Horn Cloud by name, who, as a boy, participated in the original battle of Wounded Knee, in 1891, had heard of this large gathering and, with two of his cousins, came to me and asked if he could be in the pictures. He said that all his relatives, with the exception of these two cousins, had been killed in the battle, and that he wanted to be a chief. I told him that I would be glad to have him participate in the scenes, but that he could not take the part of a chief as he was altogether too young to have been a chief in the original battle. He then tried to prevent the reproduction of this battle—'making all that noise,' he called it—saying that it would disturb the spirits of his departed relatives and retard their progress in the happy hunting ground. I tried to explain to him that it would benefit his people to have his white brother and sisters see just how this battle was fought, and he went away apparently satisfied. But just as we had made the assignment of places, Horn Cloud rode from group to group of his people, calling them cowards, and pleading with them, in the Indian tongue, to assist him in preventing us from continuing. I immediately called all the older chiefs together and asked them if they were going to heed this young man or keep their word with me and assist in reproducing this picture. The chiefs called Horn Cloud—'small head'—stated that they did not approve his actions, and that they were friendly and would go on with the picture. The strange part of this occurrence is that, in the picture, Horn Cloud seems to be one of the 'moving spirits,' notwithstanding the fact that he was not assigned any particular part, but told to re-enact what he did in the original battle. "In assigning places in these pictures no parts were given out to any persons, except the leading characters, and they were simply to re-enact what they did before, the others to follow their leads. 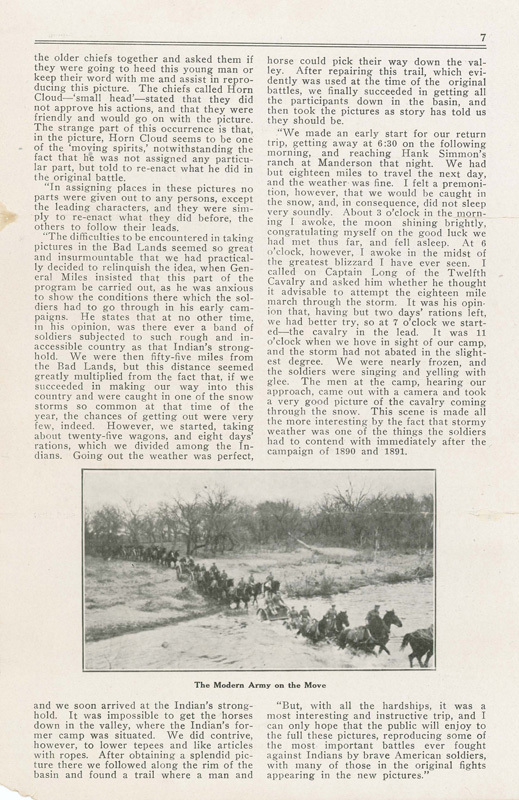 "The difficulties to be encountered in taking pictures in the Bad Lands seemed so great and insurmountable that we had practically decided to relinquish the idea, when General Miles insisted that this part of the program be carried out, as he was anxious to show the conditions there which the soldiers had to go through in his early campaigns. He states that at no other time, in his opinion, was there ever a band of soldiers subjected to such rough and inaccessible country as that Indian's stronghold. We were then fifty-five miles from the Bad Lands, but this distance seemed greatly multiplied from the fact that, if we succeeded in making our way into this country and were caught in one of the snow storms so common at that time of the year, the chances of getting out were very few, indeed. However, we started, taking about twenty-five wagons, and eight days' rations, which we divided among the Indians. Going out the weather was perfect, [photograph] The Modern Army on the Move and we soon arrived at the Indian's stronghold. It was impossible to get the horses down in the valley, where the Indian's former camp was situated. We did contrive, however, to lower tepees and like articles with ropes. After obtaining a splendid picture there we followed along the rim of the basin and found a trail where a man and horse could pick their way down the valley. After repairing this trail, which evidently was used at the time of the original battles, we finally succeeded in getting all the participants down in the basin, and then took the pictures as story has told us they should be. 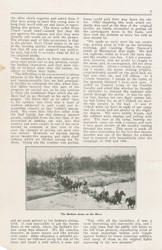 "We made an early start for our return trip, getting away at 6:30 on the following morning, and reaching Hank Simmon's ranch at Manderson that night. We had but eighteen miles to travel the next day, and the weather was fine. I felt a premonition, however, that we would be caught in the snow, and, in consequence, did not sleep very soundly. About 3 o'clock in the morning I awoke, the moon shining brightly, congratulating myself on the good luck we had met thus far, and fell asleep. At 6 o'clock, however, I awoke in the midst of the greatest blizzard I have ever seen. I called on Captain Long of the Twelfth Cavalry and asked him whether he thought it advisable to attempt the eighteen mile march through the storm. It was his opinion that, having but two days' rations left, we had better try, so at 7 o'clock we started—the cavalry in the lead. It was 11 o'clock when we hove in sight of our camp, and the storm had not abated in the slightest degree. We were nearly frozen, and the soldiers were singing and yelling with glee. The men at the camp, hearing our approach, came out with a camera and took a very good picture of the cavalry coming through the snow. This scene is made all the more interesting by the fact that stormy weather was one of the things the soldiers had to contend with immediately after the campaign of 1890 and 1891. 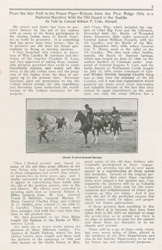 "But, with all the hardships, it was a most interesting and instructive trip, and I can only hope that the public will enjoy to the full these pictures, reproducing some of the most important battles ever fought against Indians by brave American soldiers, with many of those in the original fights appearing in the new pictures." 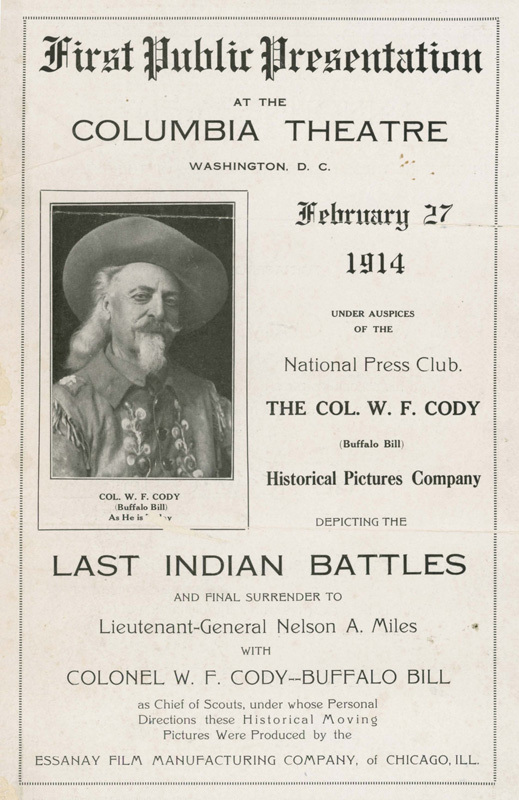 COL. W. F. CODY,—"Buffalo Bill"
Having all the value of Authenticity, Personality, Faithful Portrayal with Governmental Approval of effective collated episodes of Trailing, Finding, Fighting—In Skirmish, and Battle—directed in detail by those who witnessed and were engaged in the Melees, assisted by all the Skill and Ingenuity the Essanay Company Experts could devise—in simply reproducing events in the last days of the Centuries of the Battle between the Red and White Man from the Sanguary Campaigns of the '60—the victory at Summit Springs in 1869, when Scout Cody killed Chief Tall Bull. Of the 70s—the bloody fight at War Bonnet Creek in which Buffalo Bill in personal duel dispatched Chief Yellow Hand. To the Ghost Dance Continental rebellion craze. The Indian's Last Stand—Wounded Knee and the Mission 1890 and 1891—with death of Captain Wallace and Lieutenant Mann. 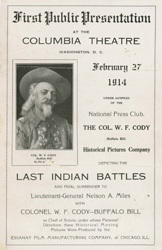 COLONEL W. F. CODY, "Buffalo Bill"